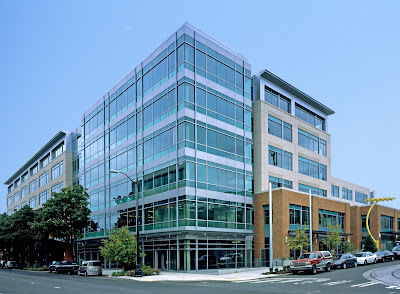 In 1995, chef Chris Keff opened Flying Fish in what was then a burgeoning business district in the heart of Belltown. Fifteen years later she’s flying out of there, setting her sights elsewhere and readying “The Fish” — as we’ve come to know and love it — for a big move to another up-and-coming neighborhood: South Lake Union. 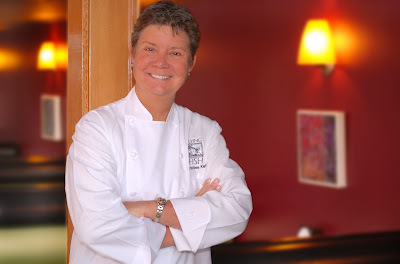 Christine Keff, at Seattle’s Flying Fish in Belltown. (photo: Mark Bauschke). Flying Fish is slated to make the move this spring to the Westlake/Terry Building at Westlake Avenue N. and Thomas Street — also home to neighboring Portage Bay Cafe. See that corner? Now envision it with a neon sign that says: F-L-Y-I-N-G F-I-S-H.
That plan includes approximately the same square footage and seats (110). Rather than a mezzanine level and a small private dining venue in the rear, the new Fish will encompass a single floor with a bar and two private dining areas opening onto the main salon — allowing for busy-day overflow and a more flexible arrangement for large parties. As in Belltown, there will be sidewalk seating, but unlike the very visible cafe tables along crazy-busy First Avenue, the 30-seat patio at South Lake Union is “slightly below the sidewalk and bordered by plants, a much more protected space,” Keff says. That’s a far cry from what’s been happening in Belltown, Keff insists, where the bar scene has overtaken the dining scene and movement and closures continue unabated. (Recent deaths include Belltown Bistro and Cucina De-Ra, and several high-profile restaurant spaces remain on the market.) In Belltown, Keff says, “You’ve got a lot of small landlords who never get together to have any say in what happens around them. And before you know it, things have gone to hell. Looking back, she says, “Things I never would imagine happened: the notoriety, the celebrity, I didn’t plan on that. When you open a restaurant, you have an idea of what it’s supposed to be, but the minute you open the doors it becomes not just yours anymore, it becomes the public’s.